Written by Nate Lakritz on September 17th, 2018. The Capcom Beat ‘Em Up Bundle contains seven classic co-op arcade games that established Capcom as a gaming powerhouse in the 90’s. The collection includes Final Fight (1989), The King of Dragons (1991), Captain Commando (1991), Knights of the Round (1991), Warriors of Fate (1992), Armored Warriors (1994), and Battle Circuit (1997). 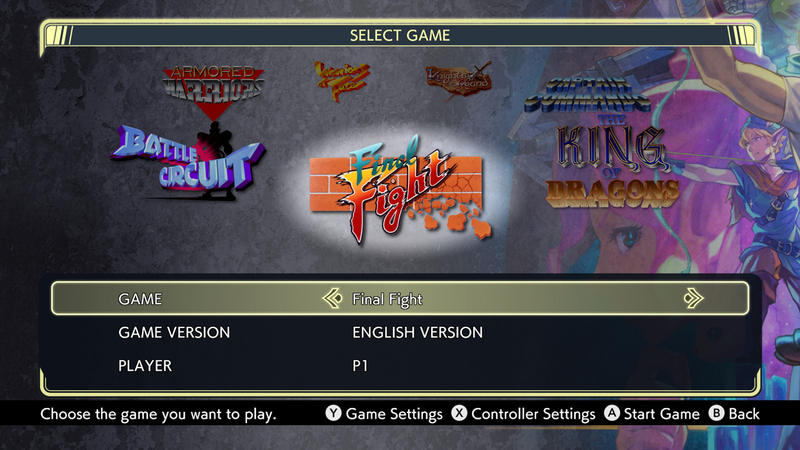 The last two title have never been available beyond the arcade, making this digital collection a must-have for Capcom fans. Players can team up locally or online with drop-in play available. Unlike the typical versions of these games, difficulty and number of lives can be modified as well. Both the English and Japanese versions of each game are included in the bundle, plus a bonus art gallery with concept art and other goodies. The Capcom Beat ‘Em Up Bundle is truly a thorough collection of fan favorite co-op games. It will be available on September 18th for $19.99 on PS4, Xbox One, and Nintendo Switch as a digital download. The Steam release has been delayed without any official date set, so stay tuned.